We’d love your help. 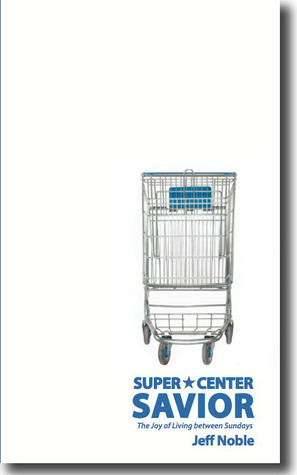 Let us know what’s wrong with this preview of Super Center Savior by Jeff Noble. Using stories, personal examples, and cultural events, Noble helps Christians connect their mission and identity with creative analogies to Wal-Mart. He issues a thoughtful challenge for Christians to rethink, reinvest, and repent of selfishness and nudges the western consumer to commit to a faith-filled, dynamic, and influential lifestyle. Super Center Savior shows what st Using stories, personal examples, and cultural events, Noble helps Christians connect their mission and identity with creative analogies to Wal-Mart. He issues a thoughtful challenge for Christians to rethink, reinvest, and repent of selfishness and nudges the western consumer to commit to a faith-filled, dynamic, and influential lifestyle. To ask other readers questions about Super Center Savior, please sign up. I know Jeff is a pastor, so initially I thought this book would be geared towards ministers, but really, this book is just as informative to anyone who has (or even wants) a relationship with Jesus. That's not to say that this book doesn't have lots to say to those to whom God has entrusted the day-to-day ministry of the local church. In fact, I was amazed at how well Jeff relayed his message to both those who serve the church as an occupational calling and those who may only be weekend attender I know Jeff is a pastor, so initially I thought this book would be geared towards ministers, but really, this book is just as informative to anyone who has (or even wants) a relationship with Jesus. That's not to say that this book doesn't have lots to say to those to whom God has entrusted the day-to-day ministry of the local church. In fact, I was amazed at how well Jeff relayed his message to both those who serve the church as an occupational calling and those who may only be weekend attenders. It's hard to communicate effectively to multiple audiences, but Jeff has done that masterfully in this book. This book uses a comparison to a retail giant that we all have to admit, whether we love or love to hate Walmart, knows a thing or two about reaching its target audience. Jeff ponders ways the church could use Walmart's philosophy to meet the needs of its target audience. And even gives some examples of how the church may be too much like Walmart. I think what I love most about this book is its practical application supported by God's Word. But this isn't stuffy, over-your-head theology. Even if you've never met Jeff, if you read this book you would feel like you were sitting across a table from him at a Starbucks, talking about living life between Sundays in the places God put us to represent Him. I certainly didn't feel like Jeff was preaching at me, but in several chapters I identified ways that I'm missing out on living out my relationship with Jesus. I love the analogy of the Supercenters to church- it actually kept me really interested. Each chapter starts with a comparison (and also contrasting points) of how the church could be/should be/is but maybe shouldn't be- like church. As the chapter progresses, it is more preachy and full of Bible verses, but the chapters are quick enough that when my brain starts to feel full, I'm at a new chapter with the light hearted commentary to kick it off. I also love that I can hear the author's voice coming through: it felt like I was talking to a friend (or maybe listening to a FUNNY sermon), but not like I was just reading or studying a Bible on my own. It was very easy to keep going! I read this in two sittings, but this would be a great Bible study book, as the chapters are quick and each would lend itself to its own discussion. Throughout the book, I kept thinking of people I wanted to share this analogy with or that point with. I definitely struggled with who to recommend the book to first. I really enjoyed this analogy of Walmart and the Christian way of life. The use of scripture compared to everyday life was thought provoking and inspiring. I write paranormal fantasy and SciFi so people are always surprised to discover I am a devout Christian. Keeping a daily mindset of being in church is key to reducing my stress and helping me overcome hurdles. Well written, well done. I'll look for more from this author. A very readable thoughtful, engaging analogy of Walmart and the Christian lifestyle. The author emphasizes his points through use of scripture and everyday situations and challenges his readers to develop a mindset of "being the church" on a daily basis. Would definitely recommend this book to all Christians as Jeff really allowed myself to open up and to ask some questions about my walk with Jesus and the Church that are definitely going to grow my relationship with God in the right direction! Jeff graduated from high school in 1986 from Pulaski Academy in Little Rock, Arkansas and attended Ouachita Baptist University. He graduated in 1990 with a degree in Communications. During his stay in Arkadelphia, Arkansas, he and a friend started a graphic design business called AdVantage Advertising, using the experience they had gained from the excellent communications department at OBU. They de Jeff graduated from high school in 1986 from Pulaski Academy in Little Rock, Arkansas and attended Ouachita Baptist University. He graduated in 1990 with a degree in Communications. During his stay in Arkadelphia, Arkansas, he and a friend started a graphic design business called AdVantage Advertising, using the experience they had gained from the excellent communications department at OBU. They designed logos, ads, and materials for restaurants, car dealerships and banks across the state and were even featured in a blurb in the AdWeek magazine. After sensing a call to full-time ministry, Jeff went to Southwestern Baptist Theological Seminary in the fall of 1991 in Fort Worth, Texas. During that time, he served at First Baptist Church Garland as the young adult minister. Graduating in May 1995 with and M.Div, he moved to Monticello, Arkansas as Baptist Collegiate Ministry at the University of Arkansas at Monticello where he served for eight years. Feeling guided to start a new church that would reach out to collegians and young adults, Jeff resigned from collegiate ministry and became the church planter of Journey Church in Monticello in the summer of 2003. He pastored there for six years. Northstar Church of Blacksburg, Virginia called Jeff to be their pastor in May 2009 after the resignation of their founding pastor in 2008. With an emphasis on “Don’t go to church; Be the church,” Jeff has seen Northstar experience blessed growth and transformation in the New River Valley which has three large colleges, including Virginia Tech.